Today, the UK’s Joint Nature Conservation Committee (JNCC) has published the third major review of the UK network of Special Protection Areas (SPAs) – special sites which are designated and protected under the EU Birds Directive. 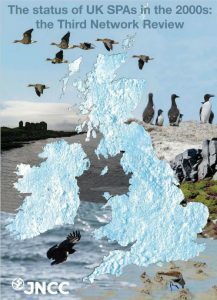 The UK network of SPAs includes 270 sites of international importance that are central to the conservation of birds in the UK. The review was compiled by the SPA and Ramsar Scientific Working Group, in which WWT participates. The review brings together extensive datasets compiled during the 2000s, including counts from volunteer schemes such as the Goose & Swan Monitoring Programme (GSMP) and Wetland Bird Survey (WeBS). It also, for the first time, assessed the completeness of the network against verifiable criteria so that gaps in the network can be consistently identified. This will allow future assessments to track progress with the designation of sites that are required to ensure that SPA suites for all species are complete (i.e. they protect an appropriate proportion of the total population). The UK SPA network is used in winter by almost 2.5 million ducks, geese, swans and waders – nearly 40% of all the UK’s non-breeding waterbirds (and two thirds of all geese and swans). It thus provides extensive protection for these internationally important wintering populations. However, some gaps in the network were identified for waterbirds, for example Iceland Greylag Geese have undergone a substantial change in their distribution, leading to a large decrease in birds using the existing SPA network. Other species with insufficient suites of SPAs include the globally threatened Common Pochard. Gaps can also relate to ecological completeness, e.g. most SPAs for geese are roost sites because that is where they are counted, but these sites do not provide the geese with all of their ecological needs, i.e. feeding areas. The review identifies that more needs to be done to protect and manage feeding areas around SPAs for most goose and swan populations. The review also acknowledges the massive voluntary efforts of many tens of thousands of volunteers who gave and continue to give their time to participate in systematic surveys and monitoring of UK birds – critical information which helps conserve and manage these important sites. The full report can be downloaded from the JNCC website and further comment from WWT and RSPB can be found here.